Explanation: The bulging center of our Milky Way Galaxy rests on a pillar of light in this luminous skyscape. Recorded on September 22nd in dark South African skies, rivers of dust seem to flow downward from the galactic center towards Antares, yellowish alpha star of the constellation Scorpius, near the top of the scene. The brightest celestial beacon present is not a star at all though, but planet Venus, still dominant in the western sky after sunset. Of course, the pillar of light stretching upward from the horizon is Zodiacal light. 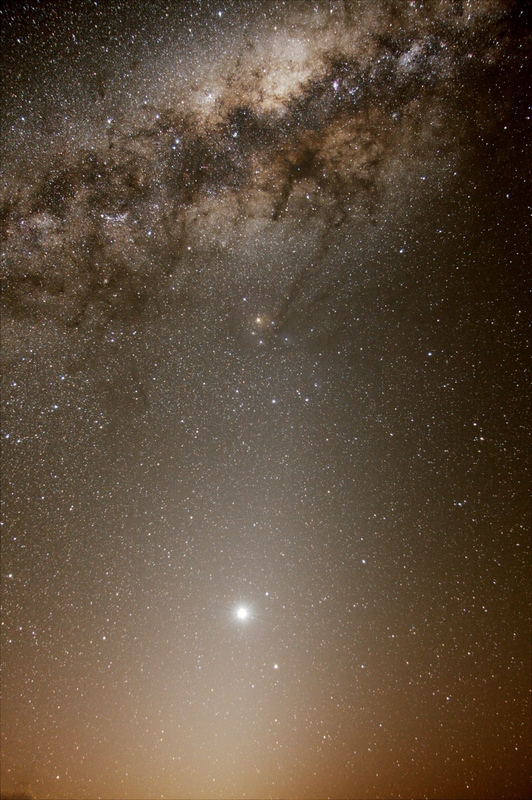 Sunlight scattered by dust along the plane of the ecliptic creates the zodiacal glow, prominent in the evening after twilight during the southern hemisphere spring.